With the Glidex Crosstrainer gym equipment for sale 600 all of the upper and lower body muscle groups can be exercised simultaneously. The even, elliptical movement of the lower limbs – with low impact on the joints – effectively combines with the forward and backward motion of the upper limbs. 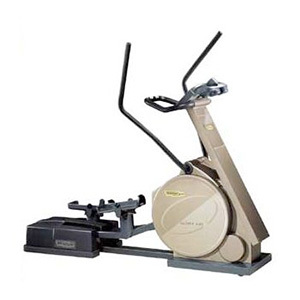 The Technogym Crosstrainer smooth, easy and multi-functional exercise is suitable for users of all abilities, including de-conditioned individuals. The low rear platform is designed to enable users to access the pedals more comfortably.